Slot Games are around every corner in Vegas. In fact, there are more slot games in Vegas than all the other casino games combined. The reason is clear: Slot games are the most popular casino game in the world. Slot players enjoy the higher payout percentages, the sheer variety of games and the chance of hitting big jackpots. The Slot games at online casinos have even higher average payout percentages than the slots in Vegas, averaging 97%. Online casinos also let you download and play their games for free, and that's something you just won't find in any land based casino. Online Slot Casinos offer literally thousands of slot games to choose from, and dozens of progressive jackpot slots. To add to player enjoyment, many online casinos also feature daily, weekly and monthly contests and prizes. All Slots Casino treats players with daily cash bonuses and fun-filled promotions. All Star Slots has a great new slot game arriving in April, Coat of Arms Slots. Slots players can cheer on the White Knight OR the Black Knight both in this new RTG slot game. Coat of Arms has a rich and delicious medieval feel. In this new slot game, black knights are wild and white knights give you up to 10 re-spins! Toss in Golden Bonus shields and a Bonus Crown Substitute symbol and you have a winning slot game! Due Date: To be released on April 6th 2011. 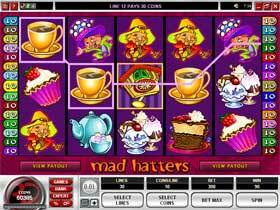 Join the Mad Hatter on this revolutionary 5 reel video slot game featuring 30 paylines! Mad Hatters Slots is a slot game that introduces some new and unique features for online slot games. Mad Hatters introduces a unique Extra Wild and Expanding Wild features. There are different and more ways to win with more paylines and up to 50 free spins! Slot Games should come with warning labels! Slots are the most popular casino game both online and off, but how addictive are they? Read about Slots Addiction before you enter the casinos, and find out how you can avoid the traps. You can't win the big jackpots if you aren't enabling every payline by playing the maximum number of coins. If you don't, your play is only increasing the jackpot for some other player to win!